LARENCORE: U.S : MICROSOFT is STILL working with ICE ?! Call NOW! U.S : MICROSOFT is STILL working with ICE ?! Call NOW! Microsoft is complicit in Trump's mass incarceration and deportation agenda. Tell them to stop providing products and services to ICE. Microsoft is standing by their contract with ICE. While CEO Satya Nadella has been in the media recently talking about human rights and the need to protect immigrants, Microsoft is providing vital products and services to ensure ICE's mass incarceration and deportation machine doesn't miss a beat. We need to encourage them to be leaders in the tech industry by actually embodying the values they publicly espouse. They're already feeling the pressure from over 600 Microsoft employees who've signed an internal petition. If we can show them that their consumers really care about their role in human rights violations and that this pressure isn't going to go away, we can get these decision makers to drop the contract and get us one step closer to dismantling ICE altogether. Let's flood Microsoft's phone lines and let them know that enabling ICE's violence is unacceptable. Making a call is really easy. Once you dial the number above, our calling tool will connect you with two decision makers at Microsoft : Jason Zander, EVP of Azure, and Steve Sweetman, Director of the CTO Office. When they answer you can read from the script below, or use your own words. Be polite and calm. While we might be angry, we need to send a consistent message that can't be twisted to discredit us. You can also leave a voicemail. Hi, I'm [state your name] and I am calling on Microsoft to cancel their contract with ICE. As a leader in the tech industry, Microsoft has the opportunity to really embody the values that your CEO has been talking about in the news. Words are great, but these times call for resolute action from Microsoft. The UN has denounced ICE's practices as abusive violation of human rights. And the calls to #AbolishICE are growing. Senator Kirsten Gillibrand has joined the demand--and even agents within ICE have called for its dissolving. What will it take for Microsoft to stop enabling ICE's violence ? Microsoft must stand on the right side of history by deciding not to provide products and services for the bureaucratic machine behind the mass incarceration and deportation of immigrants. There are no excuses for enabling human rights abuses. Microsoft must cancel the contract with ICE. 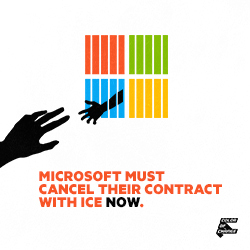 Demand Microsoft stop providing the products and services ICE needs to carry out its mass incarceration and deportation operations -- call 1-844-899-9540.